Sometimes what we make is based off of what sounds particularly great at the moment (usually guacamole or cookies! ), but other times it’s based on what we have to cook with. When faced with an eggplant that didn’t particularly appeal to us, we thought that maybe is could be improved by roasting it and putting it on pizza. Wouldn’t you know, it turned out to be an amazing combination! 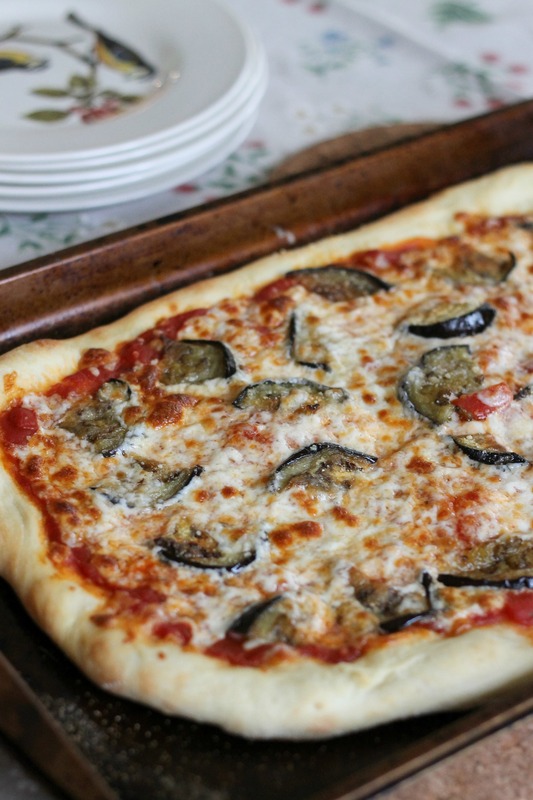 Roasted veggies are always good on pizza, and thankfully eggplant seems to be no exception! We made some pizza on our pizza stone, but ran out of parchment paper and had to make one on a baking sheet. While it turned out nicely, the one baked on the stone had a better crust so that’s what we recommend. Also, for this pizza we tried the Smitten Kitchen Cookbook pizza dough and sauce recipe, and it was a hit, but you can use your favorite sauce or dough if you’d like! Slice the eggplant and drizzle with olive oil on both sides. Season with salt and pepper. Place on a cooking-sprayed baking sheet and roast at 400 degrees for about 20 minutes, or until the eggplant is browned. Preheat the oven to 550 degrees with a pizza stone in the bottom of the oven. On a piece of parchment paper topped with a little cornmeal, shape the pizza dough. Top with half the sauce, the cheeses, and the eggplant. Repeat with the second pizza. Transfer the pizza onto the pizza stone and baked for 10-12 minutes, or until the pizza is evenly browned. Remove from the oven and repeat. Let cool briefly, then slice and serve. Enjoy!